History of Kashmir Dispute - How Indian Lost Kashmir in 1971 War? What is the History of Kashmir Dispute? What was the reason for Exodus of Kashmiri Pandits and Current Crisis in the Valley? EurAsian Times analyses the History of Kashmir Conflict and prepares a Brief Timeline of the Kashmir Crisis, starting from 1947. 1947 – Partition of the sub-continent predominantly into Hindu-dominated India, and Muslim-dominated Pakistan indirectly started the Kashmir Dispute. 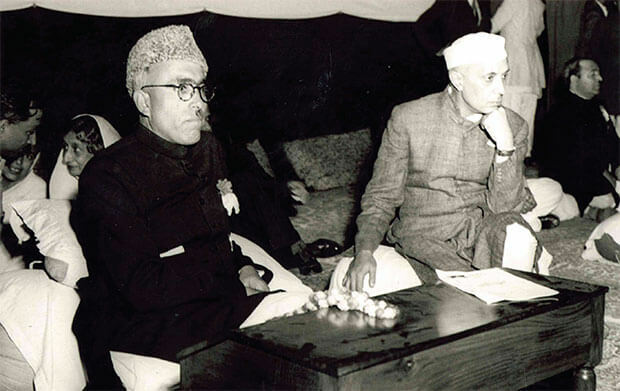 1947 – The King of Kashmir signs a treaty of accession with India after Pakistani tribals and army attack the independent state of Jammu and Kashmir, resulting in the first India- Pakistan war. 1948 – India presents Kashmir dispute in the UN Security Council, which in Resolution 47 calls for a referendum in Jammu and Kashmir. In the verdict, resolution demands Pakistan to withdraw its troops completely from Jammu and Kashmir, while India to cut its military presence to and maintain law and order. A ceasefire is implemented, but Pakistan refuses to pull its troops and vacate Kashmir. 1951 – Elections in the Indian-controlled Jammu and Kashmir support accession to India. India says this makes a referendum pointless. Pakistan says a referendum needs to take into consideration the opinions of all voters in Jammu and Kashmir, including people in Pakistan controlled parts. 1953 – The Indian authorities terminate and arrest Prime Minister Sheikh Abdullah, leader of National Conference after he takes a pro-referendum stance and delays formal accession to India. A new Jammu and Kashmir government endorses accession to India. 1957 – The constitution of Indian-administrated Jammu and Kashmir defines Jammu and Kashmir an integral part of India. 1963 – Pakistan cedes the Trans-Karakoram Tract of Kashmir to China. 1965 – Second war over Kashmir erupts between Indian and Pakistan and ends in a ceasefire and a return to the previous positions. 1971-72 – Another Indo-Pakistani war, over Bangladesh, ends in the defeat of Pakistan and surrendering of 90,000 troops, leading to 1972 Simla Agreement. The Kashmir ceasefire line becomes the Line of Control, and both nations pledge to resolve their disputes through bilateral negotiations. The Simla Agreement forms the origin of Pakistani-Indian relations afterwards. 1974 – The pro-plebiscite parties in Jammu and Kashmir abandon the demand for a referendum, in return for greater autonomy in Jammu and Kashmir. 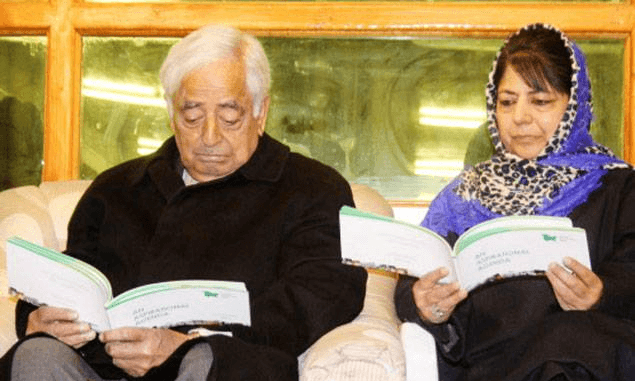 Sheikh Abdullah becomes chief minister, and his dynasty continues to dominate the political process in Kashmir including his son Farooq Abdullah and grandson Omar Abdullah. 1984 – The Indian Army captures Siachen Glacier, an area not demarcated by the Line of Control. Pakistan makes repeated attempts to seize Siachen but in vain. 1987 – Disputed and allegedly rigged elections in the state of Jammu and Kashmir, gives momentum to a pro-independence rebellion. Pakistan stimulates the insurgency by sponsoring, training and dispatching terrorists to Jammu and Kashmir. 1990 – The insurgency and tensions escalate after terrorists start to massacre the minority Kashmir Pandit’s and threaten them to leave Kashmir. After continued killings and threat to minority Kashmiri Pandits, almost all of the Pandits from the Kashmir Valley are forced in migration, living in miserable conditions in camps. India imposes Armed Forces Special Powers Act (AFSPA) in Jammu and Kashmir, giving them absolute powers in countering terrorists. 1990s – The insurgency continues, with Kashmiri and other militants training across the border in Pakistan and India deploying thousands of security forces to counter them in Jammu and Kashmir. 1999 – Fourth war erupts between India and Pakistan after militants along with Pakistan defence forces cross from Pakistani-administered Kashmir into the Kargil sector and seize upper heights. India aggressively repels the attack, and Pakistan finally pulls from Kargil after immense international pressure and aggressive bombing from Indian forces. 2001-2004 – Attempts to enhance relations between the India and Pakistan are disrupted by constant violence, particularly an attack on the Indian parliament in New Delhi. 2010 Onwards: Major protests, which Indian blames on Pakistan, have been erupting in the Kashmir Valley after many demonstrators were killed. The mobs continue to pelt stones on security forces akin to Palestine demonstrations, while the Indian army continues to hunt Pakistani-backed and trained terrorists in the Indian-administered state of Jammu and Kashmir. 2011 Indian Human Rights Commission confirms the presence of unmarked graves near in the Kashmir valley. Activists claim many may belong to those people who went missing after being arrested by Indian defence establishments. 2013 Kashmir terrorist organization, Jaish-e-Mohammed activist Mohammad Afzal Guru hanged to death over the involvement of attack on Indian parliament in 2001, again triggering massive protests in Jammu and Kashmir. 2015 BJP party, led by nationalist PM Narinder Modi, is sworn into government in Jammu and Kashmir for the first time in alliance with People’s Democratic Party. Mufti Mohammad Sayeed replaces Omar Abdullah as the Chief Minister. 2016 Mehbooba Mufti, the leader of the People’s Democratic Party becomes the first female chief minister of Jammu and Kashmir after the death of her father and J&K CM, Mufti Mohammad Sayeed. 2016 Indian armed forces kill local terrorist Burhan Wani, a popular militant and top commander of the Hizbul Mujahideen terrorist group, which triggers massive agitation. 2016 India and Pakistan relations further plummet after 18 Indian soldiers were killed by terrorists after they strike Indian army base in Jammu and Kashmir. 2016 India claims to have carried out “surgical strikes” against suspected militants inside Pakistan-controlled Kashmir, which Pakistan denies. 2017 Pakistan trained terrorists groups start to target security established in Kashmir, killing local policemen and other local defence officials in an attempt to dissuade them from joining Indian armed forces. What is the Solution to Kashmir Dispute, and How India Won Bangladesh and Lost Kashmir in 1971? This conflict has been going on since 1947. India had its chances to settle the Kashmir dispute once for all in 1971, but the lack of vision and kind-heartedness from Indian government proved to be a massive blunder. Yes, India did convince Pakistan to recognize Bangladesh after 1971 war, but Indira Gandhi certainly could have further squeezed Pakistan and settled the Kashmir dispute, having a leverage of 91,000 surrendered Pakistani soldiers in Indian jails. India again had a great opportunity when Israel offered assistance to India to bomb Pakistani nuclear sites, and that time too, India backed off. Israel had already carried out a successful military operation in destroying an Iraqi nuclear reactor in June 1981. Israel offered a similar proposal to India to attack Pakistan’s nuclear site in Kahuta, but India backed out fearing a counter-attack by Pakistan. Now, Pakistan is a nuclear power, and a direct major confrontation between India and Pakistan is unlikely. With a continuous attack on Indian soldiers, high civilian casualties, and massive agitation in the Kashmir valley fueled by Pakistan, various Indian critics suggest that only feasible solution to the Kashmir dispute is to ensure that Pakistan’s notorious Army and its intelligence agency ISI, is forced into submission and partially disbanded. Empowering the Pakistan civilian government is critical to great Indo-Pakistan relations, and the Kashmir dispute. Previous articleCan India Cancel the Indus Water Treaty, If Pakistan Hangs Kulbhushan Jadhav?